Sand deliveries began Thursday to shore up Toms River’s makeshift beach berms following the nor’easter that eroded beaches earlier this week. Powerful waves from the storm decimated a makeshift dune, which now needs to be repaired in case another storm affects the Shore area. A full federal beach replenishment project, under which permanent dunes will be built, is expected to begin this spring. 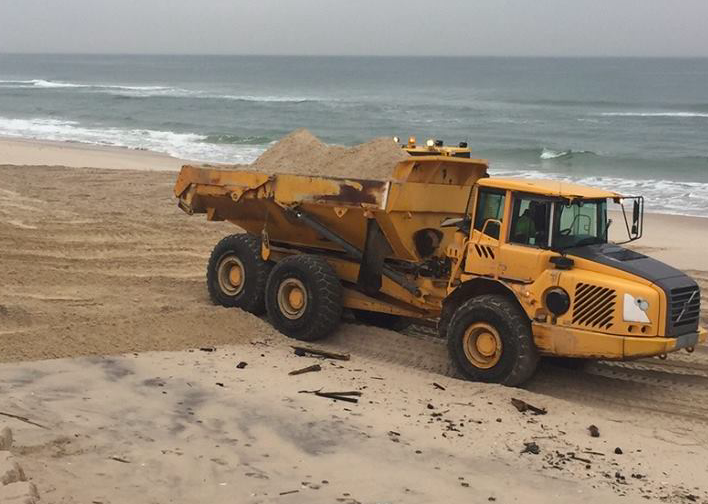 Toms River officials said Thursday that between 1,500 and 2,000 truckloads of sand will be delivered to Ortley Beach and Normandy Beach. Ortley Beach is receiving the first loads of sand, then crews from Cardinal Construction, the township’s contractor, will move to Normandy Beach. The deliveries will add up to 30,000 cubic yards total. The funding to pay for the sand replacement will come from $5 million the township council transferred last year from a capital bond ordinance account to a fund set aside for beach repairs, officials said.